This site is one of a family of websites, mobile apps, and other digital tools (Digital Tools) operated by various ministries related to Campus Crusade for Christ (Cru) and governed by this Privacy Statement. Where we use the terms “we” “us” or “our,” we refer to Agape Italia, Agape International ONLUS, Edizione Vita Nuova and affiliated ministries (our Organization). 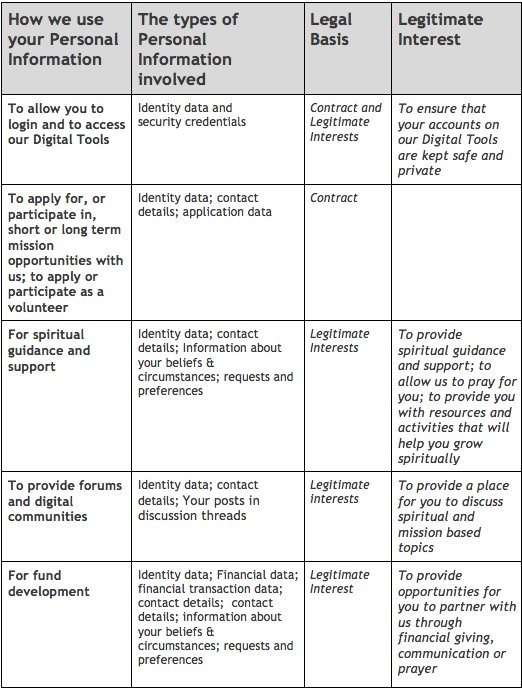 We will generally only collect and use your personal information when it is necessary to achieve our legitimate interests of fostering spiritual growth, which includes providing guidance, counselling, events, church meetings, and Digital Tools. 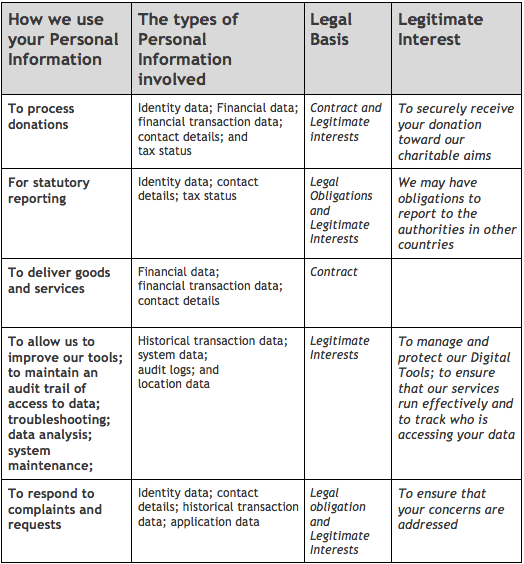 We may also use your personal information when it is needed to provide you with goods or services, or to process donations or to comply with our legal obligations. ● direct interactions: when you enquire about our activities, engage in an activity with us, make a donation, register through one of our sites or at an event, or otherwise give us your personal information. If you meet with us for discipleship or spiritual advice, we may take confidential notes for spiritual guidance and support. If you prefer that we do not take notes, please let us know. The information you disclose is entirely at your discretion. ● third parties [or other publicly available sources]: we may from time to time obtain personal information about you from third parties [and public sources] (e.g. US Census Data). We will only collect personal information from third parties if they have obtained that information in a legal and proper way. 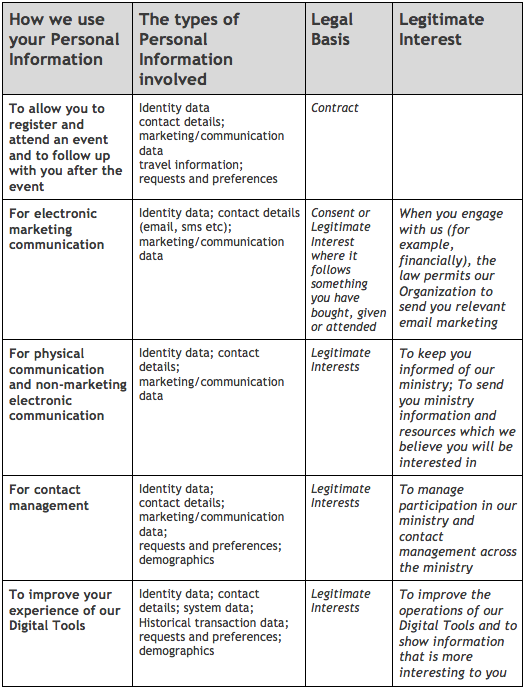 ● Referral of information by individuals: Your name and contact details may have been passed to us by someone you know, who indicated that you might be interested in hearing about our ministry, according to the chart in section 2. ● travel information including your travel details, delegate information, dietary requirements, and room preferences. The following rights under the GDPR are available to you if you are located in the EEA. If you wish to exercise any of these rights, please email info@agapeitalia.org We will respond to your request within 30 days of accepting it. Before accepting your request we may need to ask for some identity documentation from you, to make sure we don’t inadvertently provide your personal information to someone else. If one of our Digital Tools does not give you the option to edit personal information yourself or you wish to update the personal information we otherwise hold about you, you can ask us to update it by contacting us at info@agapeitalia.org. Please make sure to provide us with all the information we need to be able to address your request, including both the old and new information. ● we are required to delete your personal information to comply with our legal obligations. ● to perform a task in the public interest. ● you object to the processing of your personal information based on our legitimate interests pending verification as to whether we have an overriding legitimate ground for such processing. ● the processing is carried out by automated means. We do not keep your personal information for longer than necessary and up to 7 years after your last interaction with us (e.g. making a donation, registering for an event, or using one of our Digital Tools). We may keep your data for longer than 7 years if we cannot delete it for legal or technical reasons. We may also keep it for statistical purposes. However, if we do, we will ensure that your privacy continues to be protected and only use it for these purposes.